“Hiring” December Event Chair … Party Girls Wanted! Gather your posse and party with your pals! FAN is posting a “help wanted” ad, seeking a member to chair the December luncheon. • Appoint co-chairs as you deem appropriate for décor, silent auction, raffle, registration, promotion, et.al. For more information and to apply, please contact President Carol Huddleston, 281.221.6525, or lorac@sbcglobal.net. Wednesday July 19 FAN members will meet and eat at AMBRIZA’S Social Mexican Kitchen at 11:30. Our dynamic team of Jacquie Stamates and June McMillin are in charge. Make sure your membership renewals and or new applications are in Sherry Dunn’s hands by July 15th if you want your info in the new FAN directory. 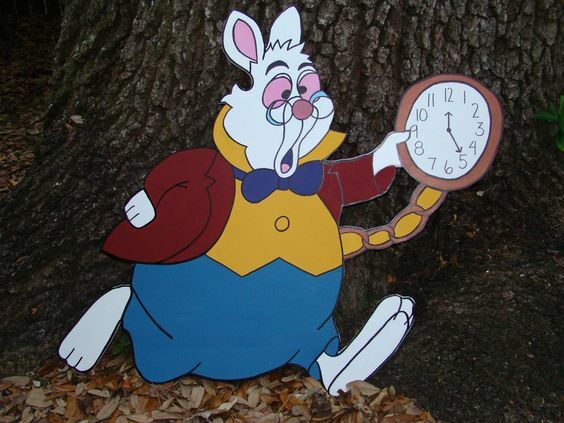 to mail in their dues while they can…..
Down the Rabbit Hole we go for the Mad Hatter Tea Party Spring Luncheon! The Decorating Committee has been hard at work getting ready for the FAN Spring Luncheon. Would you like to take a peek at some of the things they have been doing? If you haven’t already purchased your ticket for the Mad Hatter Tea Party Spring Luncheon, hurry and do so!! You don’t want to be late for a VERY important date! It’s going to be SO much fun, and you don’t want to miss it. Hilarious Hat Contest, Fabulous Door Prizes, Delicious Served-at-your-Seat Luncheon, and some unsuspected surprises are just a few of the things you can look forward to. Since this is Hat season, we hope to see you there on Tuesday, May 2nd wearing your funniest, most unusual, silliest, biggest, or goofiest hat — or not. Share a joyful morning with FAN and friends! To close FAN’s program year, we’ll share J O Y at our April 4 meeting, when Carmalyn McCracken returns with her fun-filled, uplifting ideas for rediscovering joy in the life around us. With the wisdom of motherhood and a happy marriage, refined by more than 25 years working with people to challenge themselves and to achieve more, and capped with an irrepressible sense of wonder and humor, Carmalyn is the ideal springtime tonic to shake off winter woolies and look eagerly ahead to what fills our world. She may share ideas for simplifying, prioritizing, organizing and above all, energizing our days. This is the ideal program to invite your friends and neighbors, women you care about, who would love an inspiring, fun outing. Friends and Neighbors of 1960, a nonprofit organization that promotes charitable and humanitarian projects within the community, recently gave $7,500 to the Northwest Assistance Ministries’ Family and Violence Center. The center is dedicated to breaking the cycle of violence by assisting victims of domestic and sexual violence through crisis intervention, long-term support services, and through community violence and awareness prevention education. The donation was made in February at the Friends and Neighbors general meeting. The proceeds donated to Northwest Assistance Ministries were raised through the Friends and Neighbors of 1960 annual fundraiser through auctions and raffles. The Friends and Neighbors group is a social network that includes a majority of retired professional women. The members extend community-building and friendship-making to those new to the area and those recently retired. Friend and neighbors includes approximately 300 women. Northwest Assistance Ministries is a nonprofit, community-based, multi-program social service agency that provides help to individuals and families who need assistance with basic human needs. The help provided includes food, financial assistance with rent or mortgage and medical care. Northwest Assistance Ministries’ Family Violence Center provides resources to help clients find safe places, and offers support and the services to begin again on new paths. The center offers a 24-hour hotline, telephone crisis counseling, emergency shelter, emergency food, clothing, transportation, medical assistance, professional counseling services for adults and their children, community outreach, information and referrals for battering intervention programs, on-site law enforcement, legal referrals and court accompaniment. The center also partners with Houston Society for the Prevention of Cruelty to Animals to help assure the safety of all household pets some through the PetSafe Project. The center reports that the 2015-2016 accomplishments included providing crisis intervention, safety planning, adult and children’s counseling, emergency shelter, legal advocacy and education to more than 8,400 individuals. Also, the center received more than 9,800 hotline calls from victims in crisis or individuals seeking assistance. Additionally, the center began providing services to victims of sexual assault during the 2015-16 year. The Youth Education Program presented healthy relationship workshops and other anti-violence programs to 2,244 middle and high school students. The 1960 Friends and Neighbors hopes to continue to help others in need throughout the community. The group aims to help and support new and established members in the community.